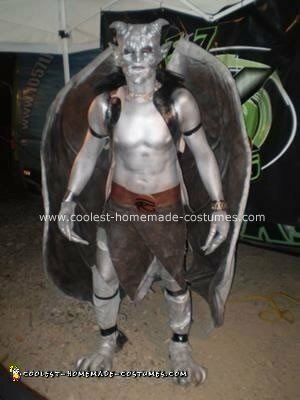 This Homemade Gargoyle Costume took me over a year to make. The wing frame is made from an old satellite dish, flexible aluminum conduit, and fabric from my buddies old sectional couch. The satellite dish makes up the main beam of the wings. I attached the conduit to the top of the dish frame which looks like the veins in the wings. I then covered all that stuff with the fabric and hand sewed it together. The wings are mounted right into the vest. There is a tail but you might mot be able to see it in the picture, which is made from the same materials as the wings. The feet are connected right to my boots which is the same fabric as the wings. To finish it off we come to the makeup which is grey spray paint from my neck down and grey hairspray on my face and neck. This costume is all hand made except for the half mask which I purchased from the local Halloween shop. That’s pretty much it. Hope you enjoy it as much as I do. Happy Halloween. Homemade costume idea posted by Brian M.
Very creative and you look great!